16 years of turf management means we understand mowing functions that benefit the turf. We know the importance of proper mowing height, a sharp cut, and the benefit of clippings. Our Premium Service includes cut, trim, and air sweep of concrete surfaces. We use the finest quality products applied by licensed professionals. Our specially formulated fertilizer is designed for the High Plains of Wyoming! Of course our estimates are FREE and we can do them year-round with our New Satellite Estimating Technology, so give us a call and we'll be more than happy to meet with you. Since every property is unique, this is only a basic list of some of the services that we provide. Depending on the individual needs of each client we can pull resources from other fields. The BEST Lawn & Turf Care in Cheyenne! 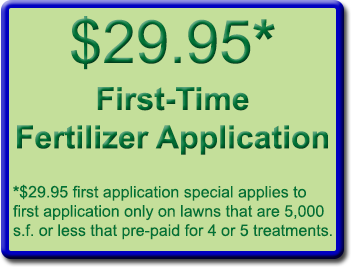 A properly managed and timed program that develops a healthier, better looking lawn. Select from individually tailored programs, one treatment, or our Recommended Complete Program. SAVE 5% Instantly with our Pre-Pay Discount! Pre-Payment Discounts apply to 4 or 5 treatments only. Proper fertilization helps plants develop strong root systems and aids older plants in overcoming disease, insects, heat, and drought stress. Proper feedings are essential for the long term health and beauty of your trees shrubs, and plants. Deep root feeding is especially important in cities where there are very few sources of nutrients. Deep root fertilizing is a process where a large spike is driven into the plants root system and fertilizer is pumped into the soil. Using Insta-Green's deep root feeding process insures a greater spread of nutrients throughout the root system. Our mixes are made to break down slowly and are immediately absorbable. This process also ensures your plants will be continuously fed throughout the year. (April - May) A fertilizer to replenish depleted nutrients from Spring Green-Up and Winter Stress. Weed Control Applications are applied if the seasonal timing and temperatures are appropriate. (June) A fertilizer loaded with IRON to rebuild the food reserve to improve the color and density. We'll take time to treat every emerging weed. (July) We will scout your lawn for new, warm season weeds that have emerged and spot treat them. Hot summer days are stressful, so we will fertilize with a "Stress Reducer" which will increase the food reserves and lessen the stress on your lawn. (August) A fertilizer to restore nutrients and encourage new root growth. Cooler nights encourage new weed growth which we will specifically treat.